Cash flow is my favorite subject by far. It’s also one of the most complicated to work with. Your money moves like water, and cash flow is the water cycle. Businesses and underwriters usually study this concept in the lending world, but I want to use a playful analogy to bring it home for us, the individuals. Suspend reality with me for a moment, and imagine your money is liquid and you are a hydrologist – let’s go down to the river. From executives high in the mountains of your company, to the vast ocean of the market place, money flows through your hands. I want you to map where it goes and make sure it’s under control. Start with a short list of where your money begins, including your job, second job, dividends etc. This is where your money flows from. Next make a list of all your accounts like checking, saving, credit cards, and specific uses (FSAs, HRAs, or retirement for example). And finally do the same thing with a list of expenses, which should be easy if you’re already on top of your budget. Tie them together with lines/excel in a way that makes sense to you. Wallah! You have a topographic illustration of your cash flow. From a bird’s eye view we can see how you capture your money like a farmer for their crop. Your savings account is a swimming pool, your checking’s a reservoir, and your credit card a river delta. Now we want to see proper levels of irrigation. When you look at your bill calendar, are there more than three dues on the same day? For example, I commonly see rent, utilities, and credit cards landing on the 2nd of every month. That’s like draining your swimming pool in one afternoon. We want cash to rise and fall gradually so as to minimize the days when we’re cash vulnerable. Obviously, many of my clients literally don’t have enough in a paycheck to cover their expenses. But by spacing out their due dates I can bolster their difficult weeks and lower points of stress. Take me for example: I pay my rent on the 20th, my utilities on the 25th, and my credit card on the 5th. Change and move your dates to keep a steady flow of water through each channel you’ve chosen so no account is dangerously low at anytime. 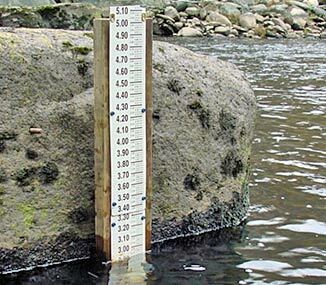 You know that ruler-thingy sticking out of river beds? That’s a water stage. Put on your hydrologist hat again and think about how you want to measure your cash flow. This can be a weekly record of all your account balances. It can be payment due notices or available balance alerts. Make it so you know when the river is high and when the river is low – this way you’ll be able to adjust your spending to account for different life events. Ever since I left high school, I’ve had a running number in my room measuring my discretionary income. I update it daily and watch it decrease during the month. I’ve come to know when it it’s falling too fast or when I can syphon it off for my savings. On my case load are six clients with serious spending problems, some of whom identify as ‘shopaholics.’ People suffering from shopping addictions are most in need of a water-stage-tool to get eyes on the problem. If you, the reader, find yourself overspending, think hard about how you want to spot the money before it flows through your fingertips. I hope my three steps to a playful analogy prove useful. Please, I would love to hear from you in the comments or feel free to reach out to me and interest me in your financial world.